In yesterday's post about my entryway improvements, I mentioned a bookshelf in my living room. When we bought the house, the bookcase was in poor shape. Built originally out of unattractive blond-stained plywood, years of holding up heavy books had deeply bowed each of the six shelf boards. 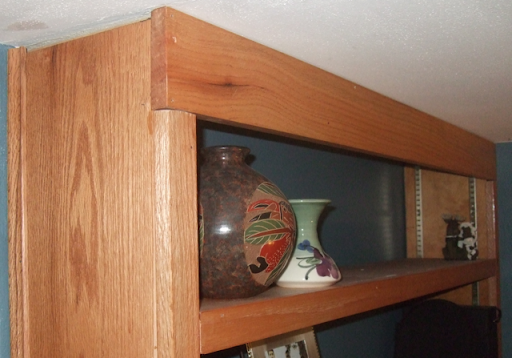 Some previous owner had tried to support the lower shelves by placing more blond-stained plywood braces up the center, creating a sort of divided middle support column. Also, over the the last 55 years, the color of the living room walls changed from appallingly hideous teal green (which by the way was throughout the house at one time), to appallingly dark brown (which by the way was also throughout the house), to a light beige, to a white -- and none of those painters ever actually bothered to take the shelf boards out of their places in order to paint the wall behind the boards. One of the six shelves is not removable; it is permanently affixed in the middle-height position; all the other boards simply lift off of supports. Even so, nobody had ever painted the strips of wall behind the five removable shelves, so the color there was teal green, and around the edges could be seen all the other colors. We carefully painted all around the shelf and behind the removable shelves. The shelf was too ugly to stay. There were two options: tear out the shelf, or fix it by putting a new attractive face on it. I decided early on in owning the house that I wanted to reface it, using stained solid hardwood boards to cover all of its visible surfaces. I made extremely careful measurements, then made them again. I planned out every single piece of wood I would need, from the large, long board to cover the outer side, to a tiny half-width trim piece running along an edge where the fireplace directly abutted. After checking my math again, I bought each piece and carefully stained them. All the pieces were solid hard oak wood. The strong oak trim pieces easily straightened the bowed boards, and today hold them flat under the weight of many heavy books. That fix alone made the whole shelf look substantially better. I put taller trim at the top and bottom of the whole shelf, for effect. I used a length of trim to make up for the one-inch-narrow side board. Although the trim down each vertical edge is 1.5 inches, the one on the left covers a full 1.5 inches of board behind it -- the original .75 inch plywood and the .75 inch oak wood. That means there is a .75 inch gap behind the right-edge trim, which covers only the old plywood. I accounted for that by shortening the horizontal shelf trim pieces by .75 inches on the right edge.